On behalf of students and youth of India, the Students Islamic Organisation of India (SIO) presented a ‘Students’ Manifesto’ before all the political parties for consideration and inclusion in their respective manifestos and agendas for Election 2019. “India is the largest democracy in the world, which provides the opportunity for people to resolve their issues and challenges through their elected representatives who would represent their demands in the legislative body and build consensus. Election manifesto is a mean to communicate people’s hopes and aspirations to potential representatives.” The Muslim students’ body said in their press release. Labeed Shafi, President, SIO of India said that the students and the youth are the biggest constituency of this country and all the political parties must specially cater to their needs when seeking for their votes. 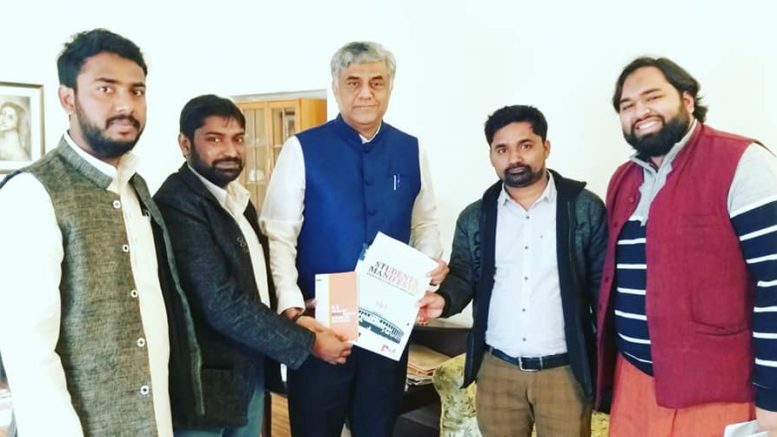 SIO leaders met and submitted the ‘Students Manifesto’ to the national leaders of political parties including Prof M V Rajeev Gowda, Convener, Parliamentary Manifesto Committee 2019 Indian National Congress, B Vinod Kumar, TRS floor leader, Lok Sabha and E T Basheer, IUML leader and Member of Parliament. Education: The section on education sharply criticizes the central and state governments for their poor implementation of the Right to Education Act, and makes a number of recommendations to improve efficiency and transparency. There are specific demands to increase the stipend of Maulana Azad National Fellowship and Rajiv Gandhi National Fellowship as well as to roll back the requirement of NET for eligibility. The manifesto also demands reservation in educational institutions as per the recommendations of the Sachar Committee report. Apart from these demands, there are also recommendations to improve scholarship schemes and provide healthcare for students. Youth:The youth issues section of the manifesto cites the disturbing trend of continuous jobless growth and makes recommendations for inclusive entrepreneurship schemes and skill development programs. It also flags corruptions in recruitment process of government jobs and demands the implementation of time-bound and transparent selection processes. Human Rights: The manifesto also highlights a number of human right issues and demands the enactment of a comprehensive law to deal with violence against religious minorities and other marginalised communities. It also calls for the introduction of rehabilitation schemes for innocent youth who are falsely charged in terrorism cases. Demands:National Register of Citizens (NRC) in Assam must be carried out in a fair and transparent manner |Institutions made for the protection of human rights should be strengthened |Section 197 of the CrPC must be scrapped | Law should be enacted for the prevention of discrimination against religious minorities in all spheres. Be the first to comment on "10% reservation for Muslims and 5% for other minorities in election manifesto, students’ body demands"